The pumps combine essential design elements of the proven centrifugal pumps with special safety attributes for industrial use. In contrast to the closed impellers frequently found in this sector, the new FPM series comes with an open impeller. 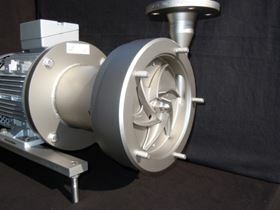 The product space is sealed off hermetically from the environment by a separating can, and the impeller is connected to the drive unit contact-free via a magnetic coupling. Fristam has based its new FPM pump series on a solid stainless steel structure in monobloc design and an easy-to-clean open impeller combined with a magnetically coupled drive unit. The pump power is transmitted contact-free and slip-free from the drive shaft via the magnetic coupling, so that the pump speed always corresponds to the drive speed, which is a vital aspect in optimal pump control. Swiss pump manufacturer CP Pumpen AG is to provide 14 of its PFA-lined magnetic drive pumps for a chemical producer in Benelux.